Observed in a garden near a guest house in Nairobi, Kenya, January 2012. This is a harmless species. Psychodidae are a diverse family of small flies that appear to be more like a lepidopteran or moth. 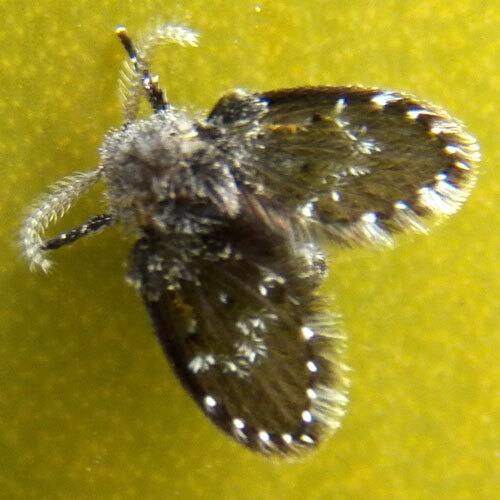 A dense coat of setae (hairs) on the body and wings give them this appearance. Most species are harmless associates of man's wastewater activities; they often live in wastewater pipes, soil soaked with splashing gray water or in the trickle filters used to treat wastewater. A subfamily of moth flies called sandflies, however, Phlebotiminae, are blood suckers and are also vectors of human disease. People not trained as entomologists would have trouble distinguishing the types. Clogia albipunctata has a world-wide distribution, probably aided by migrating humans.